Awhile ago I posted the cover image from the 2003 book catalog (shown below) for W.G. Sebald’s German publisher Carl Hanser Verlag, which included the first release of Sebald’s posthumous book Campo Santo. 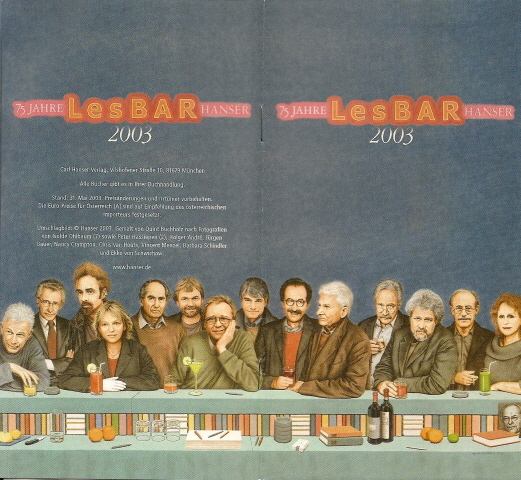 Spread across the back and front cover was a painting of fourteen of Hanser’s authors behind a bar. Quint Buchholz and the staff at Hanser were kind enough to send me a great image of his original painting, which also included Michael Krueger – the publisher of Carl Hanser Verlag – who appears on the left as the barkeeper. Krueger was edited out of the catalog cover, obviously for reasons of space. 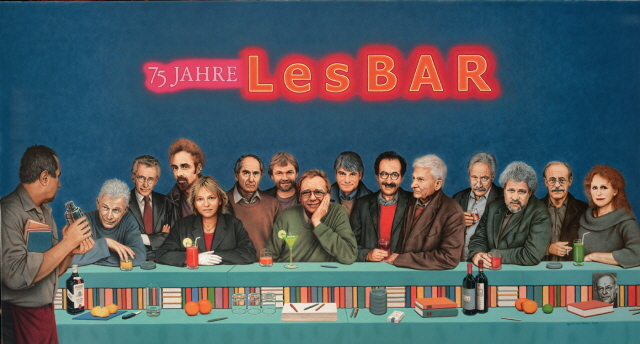 Quint says:”This painting was originally painted for a poster celebrating the 75th birthday of the Carl Hanser Verlag,”and he has identified each of the authors at the bar. From left to right: John Berger, Harry Mulisch, T. C. Boyle, Elke Heidenreich, Philip Roth, Jostein Gaarder, David Grossman, Raoul Schrott, Rafik Schami, Lars Gustafson, W. G. Sebald, Michael Ondaatje, Antonio Tabucchi, and Margriet de Moor. In 2003, W.G. 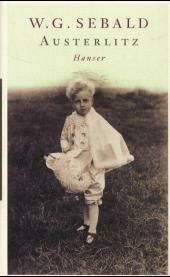 Sebald’s German publisher Carl Hanser Verlag issued a small promotional catalog of recently published books, including Sebald’s Campo Santo. Spread across the back and front cover was a drawing of fourteen of their authors behind a bar.I’m afraid don’t recognize the German authors except for Sebald (fourth from right, looking over his eyeglasses), but I do spot three North American authors: Michael Ondaatje is just to the right of Sebald, T.C. Boyle is third from the left, and Phillip Roth is fifth from the left.Artist Quint Buchholz is credited with creating the drawing from individual author photographs.Can anyone help fill in the blanks for the ten authors I cannot identify? In spite of his growing international acclaim, the German and true first edition of W.G. 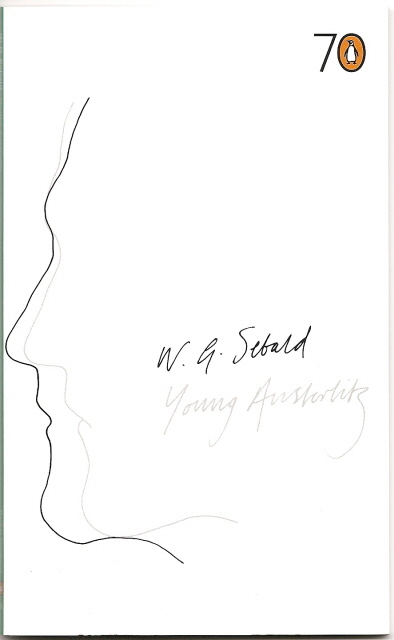 Sebald’s Austerlitz appears to have been released in a small first run before going into multiple printings.It is my impression that it is easier to find first printings of the German trade editions of Schwindel. Gefuhle (released in 1990 in a first printing of 10,000 copies), Die Ausgewanderten (published in 1992 in a run of 7,000), or Die Ringe des Saturn (released in 1995 in a first run of 10,000 copies). As soon as Austerlitz came out (Munich: Hanser Verlag, 2001) I bought a copy signed by Sebald from a German dealer and when it arrived I was surprised to find that it was already a second printing.Hanser identifies the printing states on the copyright page using the simple code that many American and British publishers use. The code on the first print run would read 1 2 3 4 5, with the smallest number being dropped for every subsequent printing.The Hanser edition is bound in a green (almost gray) cloth with a silver-stamped red leather sticker on the spine and the book comes with a red cloth page marker. The first trade edition in Great Britain (London: Hamish Hamilton, 2001) was bound in maroon cloth with a gold-stamped spine.My copy is signed by Sebald on the title page.I have seen one dealer claim that there are different states to the dust jacket, with the earliest state having the price on the rear flap rather than the front flap, but I cannot confirm this. With untraceable swiftness and assurance, W.G. 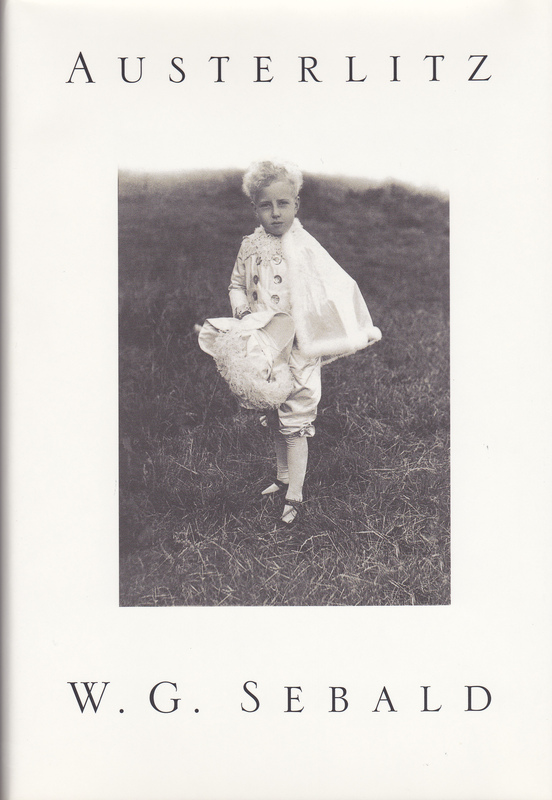 Sebald’s writing conjures from the details and sequences of daily life, and their circumstances and encounters, from apparent chance and its unsounded calculus, the dimension of dream and a sense of the depth of time that makes his books, one by one, indispensable. He evokes at once the minutiae and the vastness of individual existence, the inconsolable sorrow of history and the scintillating beauty of the moment and its ground of memory. Each book seems to be something that was purely impossible, and each (upon every re-reading) is unique and astonishing. Random House issued a paperback “Advance Reader’s Edition” that looks practically identical with the first edition. 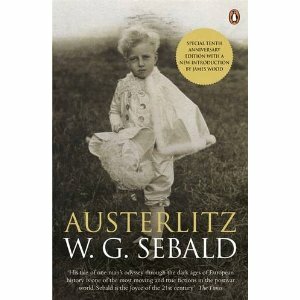 In 2005, as part of the celebrations of its 70th anniversary, Penguin (which owns Sebald’s British imprint Hamish Hamilton) issued excerpts from 70 titles spanning its publishing history.Austerlitz was chosen to represent the year 2001 and so a 58-page excerpt from Austerlitz was published in a slim paperback under the title Young Austerlitz.The excerpt covers pages 44 to 96 in the American edition, in which Austerlitz describes part of his childhood in Wales. 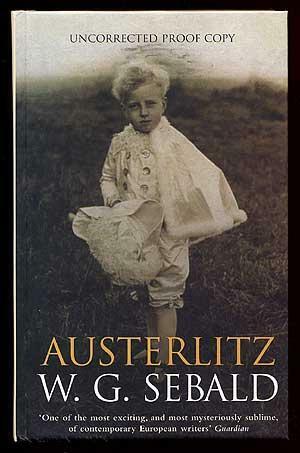 Finally, a bookmark from Hanser promoting the German edition of Austerlitz. 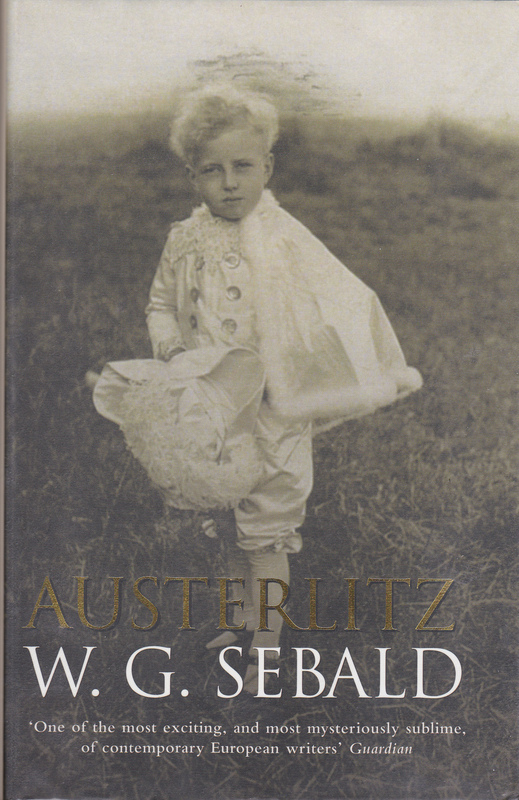 In 2011, Hanser marked the tenth anniversaries of Sebald’s death and the publication of Austerlitz with a new paperback edition, to which was added an introductory essay by James Wood.